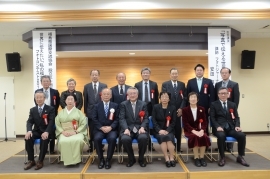 Fukushima International Association’s 30th Anniversary Ceremony, the Photo Contest Awards Ceremony and photojournalist, Natsuki Yasuda’s lecture were held on Sunday, November 4th. Thanks to all of you, 120 guests came to the Anniversary Ceremony and 190 guests attended the lecture as well. We would like to greatly thank everyone for making these events a success. We will reveal the winning photos from the photo contest later so please look forward to it!